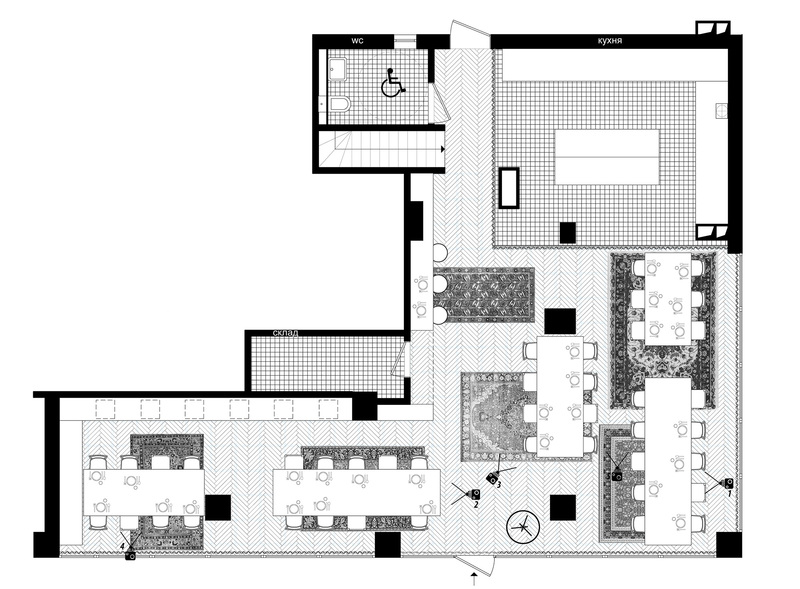 Interior design proposal for a restaurant on the ground floor of a residential building on a busy boulevard. The owner's wish was for a place with cozy, home-like atmosphere, which was interpreted in the project by the predominant use of wood for the flooring and furniture. A distinct feature defining the space are the wall-to-ceiling libraries filled with domestic objects - books, bottles, sculptures. The flooring is a dark-coloured oak parquet covered with carpets in the areas under the dining tables. The furniture - chairs, tables, lamps, also reminds of a cozy home. The kitchen area is separated from the dining hall by a glazed wall, providing the guests with the opportunity to withness how their food is being prepared.